General Choi Hong Hi, the founder of Tae Kwon Do took 15 volumes to explain this question in detail. This page attempts to give you a flavour of the unique martial art of Tae Kwon Do. Students are taught to follow the tenets of Tae Kwon Do from their very first lesson. These tenets are the basic values and ideals that underpin physical training in Tae Kwon Do. From the moment a student enters the dojang (training hall), they are taught to extend courtesy to their fellow students and to black belts. This is the very foundation of Tae Kwon Do. Although it is a form of unarmed self defence, Tae Kwon do develops the personality as well as the body. Tae Kwon Do training can be beneficial for everybody. Self defence, fitness, and confidence can all be developed. With enough dedication, the student can attain the highly coveted black belt and progress to run their own school. Patterns (Tul) A series of blocking and attacking movements against an imaginary opponent. Sparring (matsogi) Application of fundamental techniques against a moving opponent. Power (weeryok) Smashing boards and wood to demonstrate power. Special technique demonstrating the ability to attack opponents over obstacles or at a distance or height. Training in Tae Kwon Do gives both sexes and all ages the necessary skills to defend themselves against an assailant. Tae Kwon Do can be lethal when used in the wrong circumstances, which is why such a strong emphasis is put on discipline in the training hall. 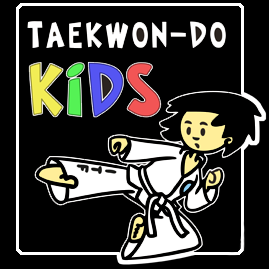 TAEKWON DO will teach your child core values such as discipline and respect. By starting at an early age, they will develop positive habits to last a lifetime. We believe in bringing out the best in your child and have designed our classes to be entertaining and informative. Your child will learn. Children who acquire self-confidence at an early age are far more likely to succeed in their adult ambitions. Martial Arts training is arguably the best method of instilling confidence into children and at the same time emphasises the importance of respect and discipline. As a result of the fast and exciting nature of Martial Arts there are thousands of children participating throughout the UK. And worldwide there are millions. Our system of training is based on inner development and self-expression; concentration, focus, goal setting, self-achievement are the topics of discussion. Motor skill development, co-ordination, flexibility and self-awareness are the basics to the physical training. Tae Kwon Do gives women confidence and fitness. It is an ideal form of exercise with a purpose and gives women the opportunity to perform against men on an equal footing. There are many people who take up Tae kwon Do in their late thirties or forties, and some progress to attain their black belt. As well as being a healthy form of exercise, Tae Kwon do is also a great stress buster! Tae Kwon Do is a suitable form of exercise and self defence for people with a wide range of disabilities. This is because it is taught in a safe and well ordered environment by experienced instructors. There are many people who think that championships and tournaments are not strictly martial arts, and to a certain extent they are right. Championships do emphasise the sporting aspect of Tae Kwon Do. Competitive sport has benefits in its own right, and regular tournaments give students the opportunity to meet people from other parts of the country and from other nations and cultures. They allow long term frIendships to be developed and promote camaraderie between the schools or counties competing. They are also part of the process in developing self confidence and provide a shop window for everyone to see the skills of Tae Kwon Do competitors.